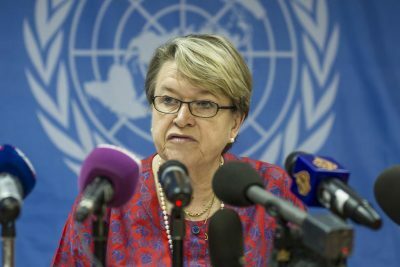 The Special Representative for the Secretary General and head of the UN Mission in South Sudan, Madam Ellen Loj earlier briefed journalists on the general situation in South Sudan following the formation of the Transitional Government of the National Unity. I am very pleased to be speaking to you after significant progress in the implementation of the peace process in the past few days. 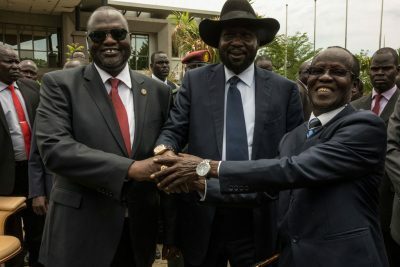 The return of the First Vice President, Riek Machar, to Juba and his subsequent swearing in marked a major, positive turn in the Peace Process in South Sudan. This has been followed up, as you know by the appointment by President Salva Kiir of the Ministers of the Transitional Government of National Unity. These are important milestones in the implementation of the Peace Agreement. I welcome this progress, as has the Secretary-General of the United Nations and the international community at large. It is now incumbent on the Transitional Government to move with speed to complete the establishment of all the transitional institutions articulated in the Peace Agreement. First, I think that it is particularly important to ensure that the Joint Operations Centre and the Joint Integrated Police are established and operationalized as soon as possible. These institutions will play a critical role in ensuring security and stability in Juba. They will also help to build confidence in the affected population and help to maintain trust among the parties that is required to progressively realize the full implementation of the Peace Agreement over these coming months. But it is equally important that peace and stability are felt outside of Juba. People across South Sudan need to feel secure to believe in peace. I reiterate the Secretary-General’s call for an immediate cessation of all hostilities. Second, we need to address the urgent humanitarian situation in South Sudan. The Transitional Government can help to ensure the free movement of humanitarian assistance, including ensuring that roadblocks do not prevent vital supplies from reaching people in need. There is also a huge gap in funding for humanitarian assistance, and I appeal to the international community to provide the support required to help meet these urgent needs. Thirdly, tackling the deteriorating economy is crucial. This includes putting in place appropriate public financial management reforms and institutions, which will give the international community the confidence they need to, increase support to South Sudan. It also means restoring access to markets for people, which will play a key role in alleviating suffering and building recovery. I urge the Transitional Government of National Unity to work closely with the International Monetary Fund and the World Bank, and the international community, in addressing these challenges. Finally, as both His Excellency the President and the First Vice President have underlined, concerted efforts in relation to national reconciliation and healing should be a priority for all. Ladies and gentlemen, in reaching this far, I would like to recognize the important role played by Presidents Festus Mogae, the Chairman of the JMEC and Alpha Oumar Konaré, the African Union High Representative for South Sudan, in helping to reach this stage. The United Nations Mission in South Sudan has also played its part. So far, UNMISS helped to fill gaps in transporting opposition forces to Juba in line with the 24 February agreements. We have also provided support to the JMEC to help with the establishment of the key transitional institutions along with regional and international partners. While I have used my good offices to facilitate the regional and international partners to reach a compromise proposal that was finally accepted by both the Government and Opposition, leading to the eventual return of the First Vice President on 26 April. The United Nations will continue to support the implementation of the Peace Agreement, and I echo the Secretary-General’s call for the international community, including regional partners, to remain actively engaged and to provide the support to the Transitional Government for the full and timely implementation of the Peace Agreement. On the 28 States, the IGAD heads of states, in a communiqué adopted on the 31st of January urged the transitional government immediately after the establishment to solve the issue of the 28 states. Now the transitional government has been established and we expect them to urgently address the issue of the 28 states. There are challenges around the country in relation to how the borders have been drawn in the 28 states proposal and that has led to many ethnic tensions in many parts of the country. First and foremost, I would like to say that the situation in former Upper Nile state around Malakal is particularly sensitive because of the ethnic composition of the population. We expect the transitional government to urgently address the issue of 28 states and in the meantime we are not formally recognizing the 28 states but we are dealing with officials on the ground on a daily basis. We are waiting for the outcome of the transitional government’s deliberation on this issue. I want to make it abundantly clear that anybody who has sought refuge and protection in an UNMISS camp is free to go home anytime. We will not pressure them, it has to be voluntary, and if any IDPs anywhere want to go home we will discuss it with them and our humanitarian partners in order to facilitate their voluntary return. One of the issues we have seen in the last few days is the occupation of IDPs homes by other people but we are ready to work on that at the request of the IDPs. A year ago, we had a project with the South Sudanese Police in establishing security in some of those areas and evict some of those who have taken over their houses. There are three national staff members detained by national security (the gentleman in question along with a colleague from Wau and another from Torit). We are raising the issue of their release over and over again with the relevant authorities including the heads of national security and higher and I can assure you that as late as a week ago after the release of the former governor of Western Equatoria I once again raised the question of the release of our UNMISS staff members we are also trying to see them on a regular basis to check their wellbeing. We are working on that and we have not forgotten those three staff members and we are doing whatever we can to ensure their release. There is a decree by the President of the Republic that I am using as a reference in dealing with those – but I don’t have to do it in writing. We have to work in finding solutions. I went to Malakal a month or two ago and saw in the press that some journalists were surprised that I have met with the governor of the Eastern Nile state created by that presidential decree. I did that because I had to find solutions for access of the humanitarian workers to the west bank of the Nile and we got permission for the humanitarians to deliver assistance to the west bank less than a week after. We have specific challenges we have to deal with in order to assist the people of South Sudan and to fulfil our mandate. The UN and the Mission, which is also, a member of JMEC stands by the JMEC’s decision (February 2nd) to endorse the IGAD summit on the way forward once the transitional government is formed. Please let me first get the numbers right. There is a lot of focus on the IDPs in our camps, about less than 200,000 but it is crucial to not forget all those South Sudanese that are internally displaced in the country and not in our camp; the estimate is at least 1.6 million if not more. There are also all the South Sudanese that have sought refuge in the neighbouring countries during the conflict (estimate about six to seven hundred thousand). The international community and international donors have been focusing a lot on humanitarian assistance because people have been in dire need of food and assistance but once peace takes root people will be able to go back and engage in long term development activities. The IGAD communiqué was endorsed by the JMEC and it requests that the transitional government urgently address the issue of the 28 states. The transitional government was inaugurated on Friday; the JMEC has a meeting on Monday. I hope and appeal to the government to deal with this issue. The second part of your question was in relation to the humanitarian access: it is a constant challenge for our humanitarian colleagues; we have seen some progress in the month of April. The humanitarians were allowed to deliver assistance on the west bank of the Nile around Malakal. We have also seen access in parts of Western Equatoria and Westerns Bahr el Ghazal. 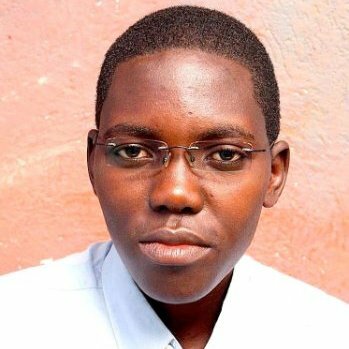 Two national staff members working for a humanitarian agency were killed close to Yei in April. The number of humanitarian workers that have lost their lives in trying to help people in dire need is unfortunately going up. We hope that the new phase in transitional government will open a new dialogue in order to help people in need. It is also important for the humanitarian agencies to get funding from the donors and the appeal for humanitarian assistance to South Sudan that was issued towards the end of 2015 up to now is only financed with around 25%. There is the World Humanitarian Summit in Istanbul, Turkey, later in the month and hopefully we will put South Sudan back on the agenda of the international donors and we hope that more attention will be paid to the suffering of the people. Humanitarian needs today is not just focused on the areas where there was fighting. Unfortunately humanitarian needs have spread to many parts of the country where there has been no conflict. There has been a number of consultations and meetings with donor partners including UNMISS and the police. One obstacle in the progress was the absence of the relevant personnel from the opposition side. Now that the bulk of the 1370 IO personnel are here we need to define the structures and strategy in order to ask assistance from the donors. 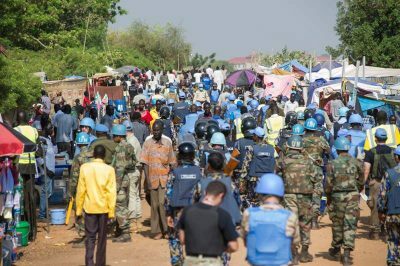 The donors are aware that the police needs assistance and training and UNMISS has been mandated by the security council to participate in that but I would advise all South Sudanese actors not to ask for money upfront but to inform the donors and the international community about your intentional goals and policies. The Security Council renewed our mandate in December based on a report from a team from New York who had visited and discussed how could the Mission react and support the implementation of the Peace Agreement that was signed in August. Our mandate from December already provides indications on certain areas where we should be active, areas such as the transitional security arrangements including the Joint Operations Center, the Joint Integrated Police, supporting the National Constitution Amendment Commission, Security Sector Reform, DDR and CTSAMM. If we compare the mandate from December to the mandate before the crisis we will find some capacity building activities on specific priority areas. UNMISS strongly condemns the attack in Bentiu, we are trying to investigate to find out what really happened. We are trying to find out whether it was an accident or deliberate. Our people are trying to interact with the various armed groups as much as possible and we trying to find out the intentions behind this attack. As for the abducted children (from Ethiopia), our presence is not all the way out to Pochalla we are in Pibor and we are trying to find out what’s really going on there. We are not deep into that community but we will support anybody to ensure the safe and urgent release of those children so they can return to their families. I do not think that it is an IOM report; I think that the gentleman that wrote this report does not speak on behalf of the United Nations or the Mission. When the time is right we will engage with the humanitarian community and the IDPs and see if there will be any assistance needed in voluntary return and take it from there. We have no intention in preventing anybody from returning to his or her home of origin. The IDP camps were for protection in a crisis situation and were not expected to be a long-term activity and we should not encourage that. The press release clearly says that it landed in UNMISS; it does not say that those who pulled the trigger were specifically aiming at the camp. It could have been an accident and we hope that this is the case because if it was directly aimed at the UN camp it is extremely serious because it will be a direct attack on the UN so we need to be very clear about the incident before we jump to conclusions. The Secretary-General established headquarters led Board of Inquiry on the incidents in February in Malakal. The team is now writing their report so I do not know anything about the outcome yet. There is also a special investigation led by Abiodun Oluremi Bashua, this investigation will look at the circumstances that lead to this event and his team will look into the interaction with other partners while the Board of Inquiry was looking into how the Mission internally reacted and responded. 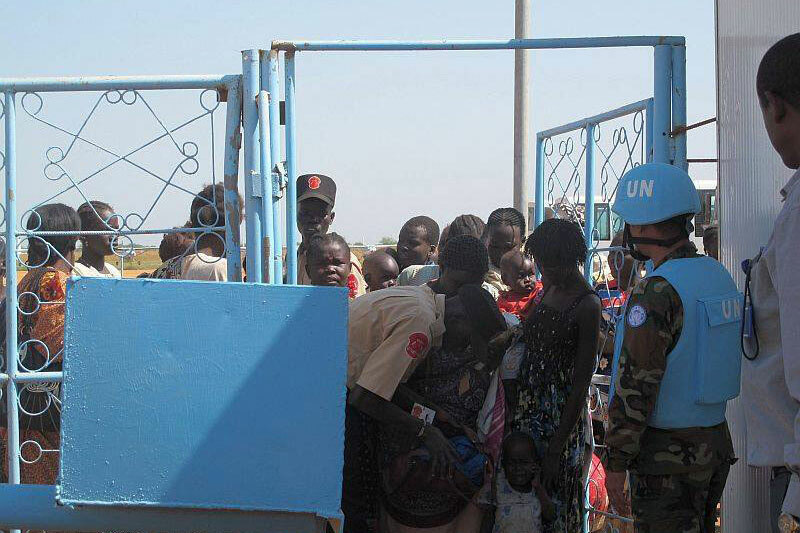 UNMISS takes its instructions from the UN Security Council and we have a mandate from the UN Security Council. We do not take instructions from any NGO. I have to trust the transitional government for the sake of the South Sudanese people that they will implement the Peace Agreement and I have to urge them to stick to their promises in creating a peaceful and prosperous nation. I urge everybody to work together in realizing that dream. The government was established on Friday and the First Vice-President was sworn in last Tuesday. I hope they will implement it. The fighting today is not comparable to what it was last year so I urge CTSAMM to monitor any accusations of violation of the cease-fire.